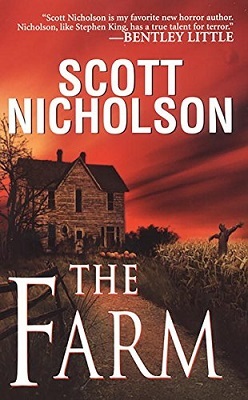 The Farm was first published in 2006. It is the story of a woman and her young daughter, who move to the country for a fresh start, but only find fresh problems. With one failed marriage behind her, Katy Logan remarries and hopes to provide her daughter, Jett, with a more stable environment. So she gives up her job in Charlotte and moves to the small town of Solom, in the Blue Ridge Mountains. Her new husband, Gordon, is a college lecturer, he owns a farm there and on that farm he has some goats. And a scarecrow—let’s not forget the scarecrow because that thing is creepy. Even when it stays put, and doesn’t start moving around, it is still one creepy, old, straw-filled dude. From the very first word, as a reader, you know that something strange is going on. The first word is lilacs and Katy knows for a fact the smell of lilacs has no business being in her kitchen. It’s not just the smell though, lots of strange things happen in the kitchen: jars fall from the shelves and a voice calls Katy’s name from the pantry. Jett is having difficulty settling into her new home as well. She misses her friends and she hates Gordon and his goats in equal measure. Worse still, she has no idea where the best place is to score some pot. Jett has promised Katy that she will never touch drugs again, but that promise is getting harder to keep by the day. Especially now that she is being stalked by a strange figure in a black hat, who turns up at the most unexpected places and even seems to have the ability to walk through solid objects. Another thing that worries Jett is the strange change that has come over her mother since the move to Solom. Katy was never really much of a cook. Now she is obsessed with cooking and spends more and more time in the kitchen using recipes that belonged to Gordon’s first wife, Rebecca, who, by all accounts, died in rather mysterious circumstances. The new passion for cooking is not the only change Jett has noticed in her mother. Katy often seems distant and, at one point, doesn’t know who Jett is talking about when she quotes a line from a Tommy Keene song. Yet Katy is a Keene fan and the line that Jett used was from one of her mother’s own CDs. Very strange. And, as the pages turn, things get stranger still. Scarier too. All is not well in Solom. I have always liked haunted house stories and The Farm is a very good haunted house story. But there is an awful lot more going on in the book than just an old, haunted farmhouse. There is, for instance, the story of The Circuit Rider—a long-dead preacher, who still visits Sodom from time to time. He spends part of that time looking for his horse, the rest of the time he busies himself with . . . more serious matters. Goats are very important in the story too. After reading The Farm, I don’t think I will ever see a goat in quite the same light again. I have never been scared of goats. I mean, who’s scared of goats? If anything is ever going to turn that around, it’s The Farm because Scott Nicholson makes goats sound very scary indeed. He also keeps the action going all the way through the book and the closer I got to the end of it, the harder I found it to put it down. I needed to know what was going to happen next, if it would all turn out okay in the end, and whether or not the goats would eat any of the main characters.